In the first 10 parts of our investigation into the booming pay-for-praise and lies-for-loot area of franchise marketing and public relations, we focused on Dr. John Hayes’ Pay-for-Praise Emporium and Franchise Fraud School. Our 11th post (NO LIMIT AGENCY & 1851 Magazine: Beyond Ethical Limits?) introduced a decidedly less colorful but likely more potentially dangerous pay-for-credibility practice that is being used by the large number of franchise sellers who have signed up with Nick Powills and No Limit Agency, publisher of 1851 Franchise magazine and website. In that post, we described how No Limit Agency (NLA) and its clients post promotional stories about their franchise opportunities in an online “news” magazine published by Powills and NLA PR staffers posing as journalists. While 1851 vows to label all paid content as “sponsored,” we’ve found that No Limit Agency/1851 magazine only designates 35%-49% of client content “sponsored” (and even then with just a small tag). 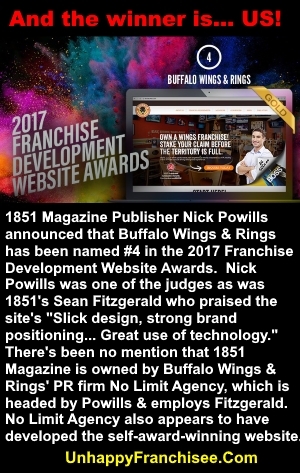 Powills takes the deception so far as to grant franchise website awards, judged by Powills, NLA/1851 staffer Sean Fitzgerald and industry cronies like Michelle Rowan of Franchise Business Review and Craig Slavin, to their own clients… sometimes for websites NLA produced. Deception Works! High Praise from 1851 Clients. The franchise industry has been waiting for innovation that works. 1851 magazine helped tell our story on way to closing more than 100 deals in 12 months. Hands down the most important development tool in franchising. As the pilot brand for 1851 in 2014, we were able to sell 5 times the franchises that we sold in 2013. We spent $400 on a specific growth market and sold a franchise. We can understand why Buffalo Wings & Rings and Showhomes would need the most credibility-for-the-buck at that time, as state regulators expressed concern that their precarious financial situations might keep them from being able to support their franchisees. STOCKHOLDER’S EQUITY AS OF DECEMBER 31, 2016, WHICH IS $1,857. So that $400 Matt Kelton spent to get to invest in Showhomes was equivalent to 22% of the franchisor’s net worth. How Does No Limit Agency Pitch Deception Marketing? Traditionally, legitimate magazines and newspapers made a sharp distinction and clear separation between editorial content and advertising, and it has always been considered highly unethical and damaging to the publisher’s brand if the two were intermingled. The Codes of Ethics of Public Relations Associations such as the PR Council and PRSA clearly state that PR firms must act with honesty and transparency, and that paid media placements or paid endorsements be clearly disclosed. The FTC Rule also requires publishers and advertisers to clearly disclose paid media and endorsements to readers and potential purchasers in order to not be deemed deceptive trade practices. … when we create a piece of content, it should extend across all channels. A press release can be turned into a media pitch, repositioned into an article to use on one of our two content marketing platforms, serve as the foundation of a social media campaign and be visually represented in an infographic. Unfortunately, Nick, a press release – which is a communication clearly marked as being from either a company or that company’s public relations agency – CANNOT be ethically “repositioned” as an article written by an imaginary, objective 3rd party and published on a “content marketing platform” created by a PR firm to look like a legitimate industry publication. So the Nick Powill’s amazing “innovation” that Mr. Thompson says the franchise industry has been waiting for, seems to be the abandonment of the clearly and legally required boundary between paid (but undisclosed) advertorials and earned media coverage from legitimate and credible publications. No Limit Agency gives clients flexible options to match their credibility buying needs. Sign up with 1851 and you will get to publish glowing, fake articles that look like they were written by actual journalists (but weren’t) about your franchise opportunity. The “instant credibility” comes from the fact that all the wonderful things the franchise sellers say about themselves in the articles are made to look like the opinions and research of actual bylined journalists (with titles like “1851 staff contributor” or “1851 Editor”) but are actually No Limit PR account executives, content writers, or even graphic designers. 1851 claims that all paid-for content is labeled as “Sponsored” content, but that’s simply not true. The example article in the Smoothie King graphic above contains no “Sponsored” content label. In fact, we reviewed 93 promotional articles published about Smoothie King in 1851 magazine in 2016. Only 33 (35%) of the Smoothie King articles were labeled as sponsored content. Many of the franchise sellers post the 1851 stories on Twitter and Facebook as if they are real, earned stories, and many display the 1851 feed on their websites not as press releases or blog posts, but as Franchise News. Opinions Invited: Isn’t Fraud “Repositioned” as Truth is Still Fraud? I don’t know Nick Powills and have never dealt with him personally or professionally. I admire his energy and his eagerness to promote his clients. I might have found his cute YouTube videos in which he and his sidekick Cassie toss M&M’s in each other’s mouths or play Connect4 endearing except for two things. The second is that what Nick Powills appears to be doing, in my opinion, is helping questionable franchise companies create an image of credibility that they haven’t earned – with the goal of deceiving, if not defrauding, franchise investors. And while Nick Powills, No Limit Agency, and 1851 Franchise Magazine may seem to be advancing the brand images of their clients, aren’t they also setting them up to be criticized and exposed for questionable representations and fraudulent inducement of franchise investors? I welcome opinions from all viewpoints and all sides of this issue. Comment below or send an email to unhappyfranchisee[at]gmail.com. ARE YOU FAMILIAR WITH NICK POWILLS, NO LIMIT AGENCY, OR 1851 MAGAZINE? ← NO LIMIT AGENCY & 1851 Magazine: Beyond Ethical Limits? You’ve nailed it – they carpet bomb our clients with emails under the 1851 banner then quickly shift to selling PR services. Not just my firm based on conversations I’ve had with competitors. However, the most troubling issue to me is the fact that Nick gets away with having naive franchise brands pay him to create branded content that he owns (resides on his site) and uses to build his own website rankings and traffic – they even pay him to create and boost ads on LinkedIn and Facebook that drive visitors to HIS site versus the brand’s website or social channels. So Nick is there No Limit to what you do? Nick are you the originator of Amish Man’s Miracle Heater newspaper ads? Franchise PR Professional you are right that Nick is using his clients to drive traffic to his site. He gets franchisors to put 1851 articles out on FB, Linkedin and email it to their prospects which is stupid for franchisors to do. Nick is supposed to be getting the franchisor’s brand noticed by his distribution and that makes Nicks clients fools for overpaying and getting nothing. I have no idea whether he does this or not, but I would be concerned that if all the “placements” are housed on a site that he controls, he can hold a gun to the head of his PR clients if they want to switch firms. Assume for a minute that some of his clients are good franchisors that simply have not thought through the ethical issues. They decide to leave and find that if they do, their stories all come down and they have to start over. Franchise Professional you make a good point that the articles are controlled by Nick Powills, No Limit Agency on 1851 Magazine. Nick Powills, No Limit Agency on 1851 Magazine are not reaching anyone with their distribution. Lawyers are advertising on 1851 too. You’d think they would look at this before they pay to market with Nick Powills, No Limit and 1851. Mr. Powills I ask you sir why have you not responded to these concerns about your PR and promotional activities? Do you not think it is your responsibility to explain why you believe what you are doing is lawful, honest and has integrity? You owe this to your clients do you not? Yes Nick we do want to hear from you. Unfortunately this is franchising. This is being sold as an alternative to using Franchise Brokerage which honestly the vast majority of time using a franchise broker will get the potential investor nothing since franchise brokers could care less if someone looses everything they just want the commission. This is just another example of how bad franchising has become. Since money is once again available via loans and more importantly via home equity loans the rush is on to sell as many franchises as possible and to do this tactics that are unethical or border illegal are used all the time. Interesting these guys target lawyers to try to increase sales. A good franchise attorney can be a big benefit but only if they will advise the client that no matter how fair or how great the contract is written when they purchase a franchise the franchises will need to have the funds to fight for their rights, including in court, the franchise contract they sign will not protect them like most think. I know there are some amazing attorneys out there that don’t just read contracts for their clients they actually look at the Franchisor and it’s history of lawsuits and history of complaints. They then give the client a real picture or the best one they can of what they will be facing if they purchase a franchise. Many other attorneys simply read franchise agreements and base what they tell clients on what they read. Good work on exposing this outfit. Hopefully people will read this and not bade any buying decisions on fake articles like this . Nick come on “Mr. PR Professional” you got nothing to say on this. Nick you know lotsa franchisors read Sean Kelly. They may not like him but they do read his articles. By the way your current clients are not amused by this and you, buddy. This is never going to go away and this is continuing stain on Powills, No Limit and 1851. Matt Kelton and ShowHomes has been franchising since 1994 and has 64 franchises. That’s an average of 2 franchises a year. Nick I think you should say something here explaining your PR strategies. This seems like it is sleazy PR. May even not pass the smell test at the FTC on the first smelling. Nick what do you say? Nick your name and this PR scheme of yours is being talked about amongst franchisors. Unhappyfranchisee and Bluemaumau are on CEO and c-suite in franchising reading lists. You are very popular my good friend. Gee whiz Nick what’s it going to take for you to address this crisis you have? Or is your PR firm not proficient at Crisis Management? You could hire Fishman Public Relations or Sanderson PR to help you with this. This is quite a clever bit of a scheme Nick Powills that enriches you and makes your clients pay for it. Mr. Powills I will help fix your problem but first you have to come here to confession and admit you have sinned. Then I will help you with your restoration. Sean Kelly and Unhappyfranchisee. Com has been the only ones on the front line of trying to show the current state of franchising I don’t believe when this started Sean ever could see that so much time would be put into the negative side of franchising compared to the good but I believe he learned quickly that the negatives were way out of balance with the positives and that is a shame. I would hope that a cable network such as Fox Business Or CNBC would pick up on this sites hard work and at the very least look at all the hard investigative work Sean has done because it’s great honest research that has uncovered a cancerous Franchise System throughout franchising. Sean has been attacked by some large outfits but has been able to win every battle because he has the truth behind him. It has gotten so bad that trying to find the good in franchising is a monumental task with so much bad that has been allowed to snowball for years now! I’m sure Sean would love to be able to spend more time talking about the positive side of franchising and the good it can bring to the right people versus the bad in franchising. I know it would create a ton less headaches for him at time. But Sean has been a voice in the wilderness, standing up for those who have been wronged or deceived plus has created this website which has allowed so many franchisees from so many different franchise systems a place they can not only vent but also a place where they can support others in bad situations. Most Importantly it is a site that prospective franchisees can go to and get the real story of what franchising can be! Nick Powills is in bed with Fox News by getting his clients on Fox and Friends on Saturdays. He certainly gets paid a lot by franchisors to get franchise brands on the show. Thanks very much. Your characterization is right on the money, and your kind words are very much appreciated. The franchisees who contribute here deserve immense credit. This rather sick machine depends on meek victims who go away quietly. This site is possible thanks to those franchisees who just can’t move on without warning others about what they need to know to make informed decisions. There are many good people in franchising. Hopefully, they’ll start speaking up and will stop letting the lowest of the low set the tone and the moral climate of franchising. I mean, enough is freaking enough. Nick, Stan the Man here! Where are you buddy? You gotta tell your side of this story. I am with Stan on this Mr. Powills you should tell your story here and set the record straight. Hey Nick where are you buddy? Have not forgotten about you lil Nicky Powills. Nicky Powills saw you were at the International Franchise Expo in New York this week. Did you line up new franchise clients for your marketing schemes? Little Nicky where are you bud. Being the PR expert that you are you should be managing your reputation. Nicky you could tell my friends how much you dislike being exposed on Unhappy Franchisee but you can’t come here and explain Mr. PR Expert? What is going on with Nick Powills? Hey Nick I gotta say that this makes you look pretty bad not responding. You could explain this and get out the doghouse on this.? Nick the pleasure of your response is expected. At least he isn’t topfire media and matt jonas, the worst franchise pr group in history. Jonas is on a path of destruction to take out reputable franchise pr groups who have decades of work experience. Mark Seibert, get out of public relations and stay in your lane. If you are a client or former client, I apologize if you feel TopFire Media has let you down. Please call me directly so that we can attempt to resolve whatever issue that you have had with them. If you are a competitor, I will hope that you are one day treated with the same professionalism which you have afforded me here. Friendly Neighbor there’s not much out about Topfire like there is with Nick Powills. Maybe Matt Jonas and Topfire deserve an article so people will know what you are talking about? Hey Nick still waiting to get some of your extraordinary PR expertise with your crisis! Nick I know you watch this very closely. This calls your integrity into question and it looks bad for you, bud. Nick there a many franchisors who read this about you on UnhappyFranchisee. It is costing you business. Have a nice weekend and we will be sure to keep this at the top of the feed here.